Moderates like Bill Clinton once promised a “third way.” Hickenlooper just might be Clinton’s 2014 successor, showing a way forward even on issues that are gridlocked at the national level. So, Politico—do you mind us calling you Politico?—Politico, let us get this right: Hickenlooper is a moderate, not just a progressive in beer-swilling clothes, because he passed some of the strictest gun laws in country (your words, not ours) that was absent of any bipartisan support, absent from almost any elected law officials support, and, ultimately, resulted in three state Senators either being recalled or resigning? Well, he is number 43 on the list, which, we’re guessing means you started writing numbers 12-42 about two hours before deadline. 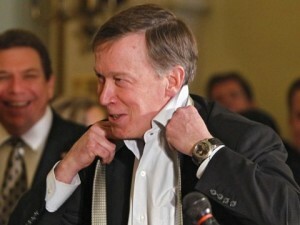 See, this is what happens when people try to reconcile Hickenlooper’s false façade with his actual actions. His ability to be a moderate falls short of his rhetoric. Just today, a new advocacy group was announced (h/t Ed Sealover) because Hickenlooper destroyed the old moderate one. Colorado Builds, the new organization, is the direct result of “moderate” Hickenlooper breaking what was once regarded as one of the most bipartisan groups in Colorado, the Colorado Association of Home Builders, apart. Hickenlooper was so “moderate” that even the Democratic lobbyist for CAHB resigned in disgust over the way Hickenlooper was using the organization. Unfortunately for Hick, the Republican Governor’s Association just released what The Denver Post’s Lynn Bartels describes as “a brutal ad” against him. Not only do they reveal how clearly he is not a moderate, but they do it while cutting him at the knees on his so-called quirky likability.